If you own a boat, you know how great it is to hang out on it with your friends in the evenings and on weekends. Enjoying great conversation, good food and awesome music is the perfect recipe for fun and relaxation. 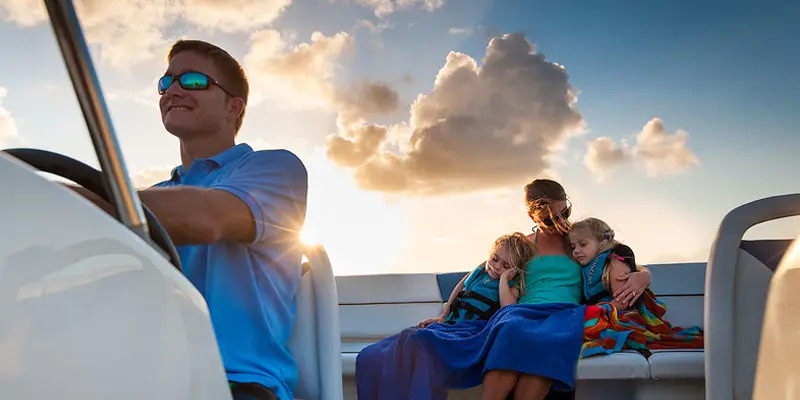 When it comes to designing and installing a marine audio system on a boat, there are some specific product requirements that will help ensure it lasts for years and always sounds great. Let’s take a look at a few. Imagine the cockpit of a bow-rider or wakeboard boat. If you were to install a conventional car audio CD player in the dash and get it wet, it would stop working. Maybe not right away, but all the exposed internal components that are not protected against corrosion will fail eventually. The same goes for speakers. 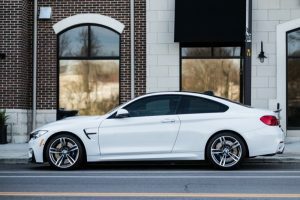 Car audio speakers can handle a few drops of water now and then, but being rained on or splashed a lot will do them in. Water-resistant source units are built with control panels that seal themselves when closed. 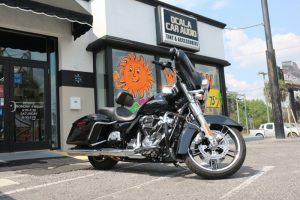 They include rubber gaskets to ensure water won’t get into the back of the radio, and the buttons and controls can withstand whatever Mother Nature throws their way. Look for an Ingress Protection (IP) rating of IP66 or higher. The first number in the rating describes the dust protection capabilities, and the second describes moisture protection. An IP rating of 66 means it is fully protected against dust and against water being sprayed by high-power jets. Specifically, level 6 jets spray 100 liters (26.4 gallons) of water per minute at a pressure of 100 kPA (14.5 psi), at a distance of 3 meters (9.85 feet) for a total of 3 minutes. No water can get into the device during the test. While direct exposure to water is a problem, so is exposure to dampness and humidity. Thankfully, companies that design source units designed for a marine application coat their circuit boards with a non-conductive water resistant coating. This is referred to as conformal coating. It prevents moisture from corroding component connections inside the radio. 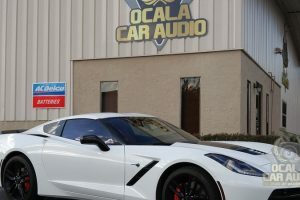 Thanks to Prestige Car Audio And Marine for sharing this picture with us. A genuine marine speaker is designed in the same way. These speakers include a rubber gasket on the mounting surface to seal them to the boat. For a coaxial speaker, there must be a secondary gasket at the base of the woofer cone to prevent water from getting into the speaker’s motor assembly. Without this seal, the top plate and T-yoke of the speaker will corrode. 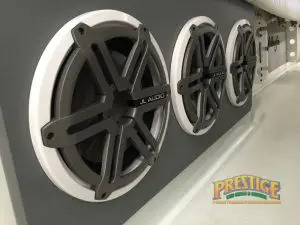 Good-quality marine speakers often include drainage channels to let water out from the behind the grille and include provisions for allowing wiring to be secured to the speaker. This prevents speaker wires from being pulled off when objects like life jackets or fishing rods are being pulled out of storage lockers. The second challenge is the sun. Almost every boat sits outside in the hot sun all summer. The sun will dry out plastics and fiberglass resins that are not designed specifically to handle harsh UV rays. The materials can fade, turn yellow, crack, turn chalky or simply dissolve. The UV rays cause the microscopic carbon bonds within the plastics to fail at an atomic level, causing free radicals. Once these free radicals (which are highly reactive molecules) are exposed to oxygen in the air, the material starts to fail. Quality marine audio products are made from plastics like Centrex 814 and similar materials that are designed to withstand UV exposure. Marine manufacturers often specific industry-standard testing procedures such as ASTM D4329. This test puts products in intense UV exposure situations to verify material stability. The American Boat and Yacht Council (ABYC) has a set of guidelines for the installation of electrical and electronic equipment on boats. While the ABYC guidelines are written for boat manufacturers, they are good practice for anyone who works on boats. Of interest to the installation of marine audio products is the requirement to use of ignition-protected equipment. Ignition protection-rated devices were designed for use in environments where there are fuel vapors, such as the engine compartment of your boat. In these applications, the devices cannot produce any spark or another form of ignition of flammable substances during normal operation. Manufacturers of compliant products have their products tested in a chamber filled with a flammable air/fuel mixture. The device is operated and cycled through its functions repeatedly to ensure that it is safe. 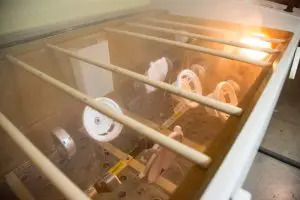 The best part of the test is the conclusion: To confirm the validity of the test, a spark is created inside the test chamber to ignite the fuel. Yes, they blow up the product under test. I know – cool, eh? Devices such as remote controls and circuit overload protection devices (fuses, circuit breakers, etc.) should be ignition protected. Why risk the alternative? Marine source unit manufacturers put a great deal of effort into their source unit accessories, from simple wired remote controls to units with color LCD displays and wireless units. 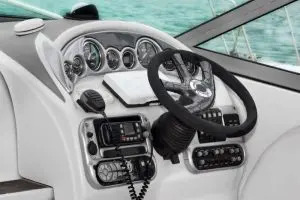 There are hand-held Infrared and Radio Frequency Remotes, remotes with extra features and outputs to control other functions on your boat (hatch covers, lights, etc. ), and even remotes that will let you use your iPod or iPhone to control your radio and see what is playing. These features are not typically found on common “car audio” units. If your boat is going to be operated near saltwater, fear not. Marine entertainment product manufacturers test for reliability under extremely salty conditions as well. In fact, most manufacturers of marine audio products do extensive salt spray and thermal testing, along with the UV and water ingress tests. Look for ASTM B117 Salt Fog Exposure testing on the products you are interested in using. 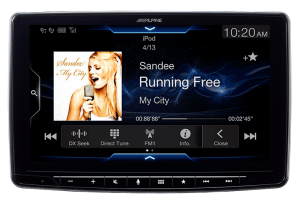 It’s no secret that marine audio products cost a little more than similar car audio products. 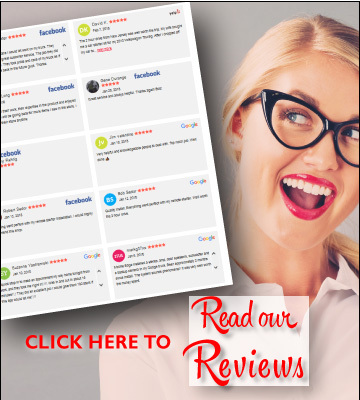 You are making an investment in their reliability. The last thing you want is to sail out on the first day of a long weekend and have your system not work. With quality marine audio products on board and a professional installation, you will always be entertained.